CJ Jones is 75-odd years old, and although he moves around slowly, he thinks in short sharp bursts, which in Portland writer Charles Deemer‘s new novel Sodom, Gomorrah & Jones translate into short sharp chapters. It’s almost more of a novella, really, if the categorizing makes a difference, with a lot of air: some of those chapters aren’t much more than a paragraph long. And the writing’s lean – bent on telling the story rather than playing around with the words, although the story, such as it is, is not of the traditional narrative sort. Things meander, tautly, without an awful lot happening. But as you’re reading it you gradually begin to understand that the novel is moving on two tracks. The first tells what CJ, a retired history prof at Portland State University whose specialty had been the moral debacle of the United States’ dealings with its Indian nations, is doing and thinking. The second, more subterranean, suggests what he’s feeling. And when the thinking and feeling finally align, both CJ and the novel ride off into the sunset – CJ into a diminished but genuine if intriguingly detatched rejuvenation of further adventures, the novel to a neatly clipped conclusion. 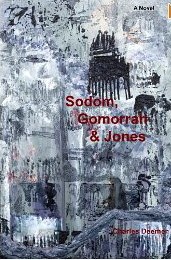 Sodom, Gomorrah & Jones is a quick read, and deceptively simple. It begins at a funeral in Portland and ends in a minivan camper in Mississippi, with an audio reader on the stereo reciting one of the bawdier passages of Chaucer’s The Miller’s Tale. In between –through folk singing and drinking and encounters with younger women and older women and new technology and new sexuality and his belated discovery of the other great love of his late wife’s life – CJ slowly sheds the parts of his past that are weighing him down and keeps the parts that can catapult him into vigorous old age.